Like most business leaders, great disruptive entrepreneurs and CEOs such as Jeff Bezos, Charles Schwab, Reid Hoffman, Lou Gerstner are ambitious, competitive, and resilient individuals committed to winning. But what distinguishes an outstanding disruptive CEO from the legions of other successful business leaders are seven very specific and unique traits. Although many senior executives exhibit these characteristics at various points in their careers, successful disruptive leaders live all seven all the time. Once a week during February and March I will be writing and publishing a short essay about one of the seven traits using an example of a contemporary disruptor who exemplifies that characteristic. First and foremost, impactful disruptive leaders are Brainiacs – highly intelligent, some would even say brilliant, individuals who see opportunities to learn and grow everywhere they look. They easily transition from logical reasoning to more creative, visual, and nonlinear ways of thinking while synthesizing disparate parts into something original and new. 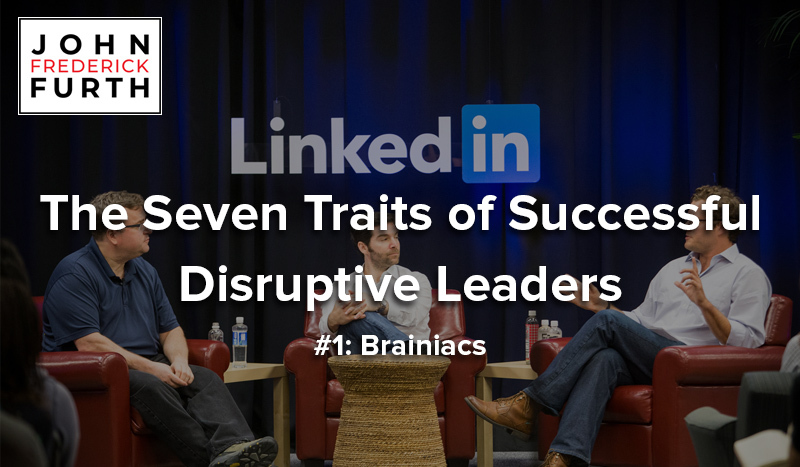 Reid Hoffman, the founder of Linkedin, is a prime example of a “Brainiac Disruptor”. He studied at two world-class universities, Stanford and Oxford where he earned a B.S. in Symbolic Systems and Cognitive Science and a M.St. in Philosophy. Like many Brainiacs, Reid initially wanted to be an academic which he saw as an opportunity to make an impact, but later realized that an entrepreneurial career would provide him with a larger platform. When journalists and Reid’s close friends, collaborators and business colleagues describe him he comes across less as an intrepid and decisive leader and more like a nutty professor. Like many creative people bursting with ideas, he’s not particularly well organized. In fact, many people say the same thing: Reid is not a business-running kind of guy. He likes to take off his shoes, think of the world broadly and not worry about corporate spend and margins. And yet when he started LinkedIn and built it quickly and profitably into a large company so successfully that Microsoft was willing to pay $28.8 billion he joined the ranks of great disruptors. Reid Hoffman is just one of many disruptive entrepreneurs and CEOs who have B.A.s, Master’s degrees and even PhDs from the highest-ranked universities in the world. But In the end being a Brainiac has almost nothing to do with how studious you were in your 20’s or how many degrees you have. In fact, some of best-known disruptive business leaders – Bill Gates, Mark Zuckerberg and Steve Jobs – never even finished college. The common thread for all successful disruptors is an active commitment to lifelong learning. No surprise then that one of the masters of disruption, Jeff Bezos, turned his passion for reading and selling books into the cornerstone of a global empire.